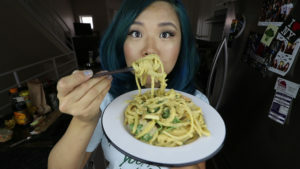 Watch above to COOK WITH ME and scroll down for the written recipe! There are a few non-vegan cooking channels that I follow on YouTube to get inspiration for cooking. Don’t get me wrong, it really does hurt me that I see so many animal products being used in cooking through these channels and sometimes I would prefer to completely avoid looking at it, and only sticking to vegan recipes. But I feel that this would be a disservice to veganism as I think it’s important to show people that we can easily veganize non-vegan recipes and enjoy the same types of foods in a vegan way. 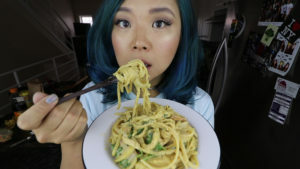 I feel that so many dishes can be so easily veganized and still taste absolutely delicious and sometimes following these non-vegan channels and social media accounts really helps me get inspiration to have new and creative ideas! I was inspired by a YouTube channel that I follow called Future Neighbor. 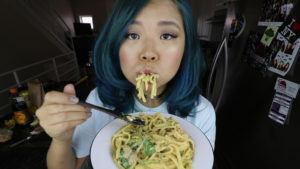 This is one of the non-vegan cooking channels that I follow who make lots of Korean dishes. I watched one of their videos where they make a pasta called Toowoomba Pasta, which apparently was/is a dish in Outback Steakhouse restaurants. It was supposedly very popular in Korea, especially. Not really sure why?! It’s a dish that includes a lot of heavy cream and shrimp and has a slight spice to it. This sounds like the most un-vegan dish ever, right?! 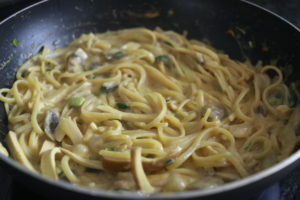 Now I’m not saying that this is a complete copycat recipe of the dish – it’s simply INSPIRED by. 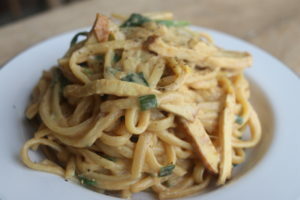 I watched the video by Future Neighbor and I decided that I just had to veganize this dish – it seemed simple enough. 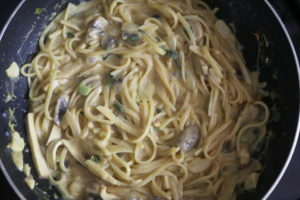 I also wanted to challenge myself by not only veganizing the recipe, but also making this a ONE POT PASTA DISH. 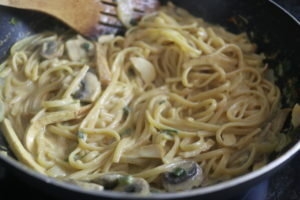 Plus, this is going to be a much healthier version because I didn’t go too heavy on the fats – I used a small amount of full fat canned coconut milk, but other than that the ingredients are very clean and much lower in fat than using heavy cream. So not only is this a veganized recipe, it is also healthier AND you don’t have to wash more than one pot! Well, the result was nothing short of amazing and I have to say I was very proud of myself. Almost nothing went wrong, which is a rarity in my “Cook With Me” videos (video series where I show myself cooking something I’ve never made before and hoping it will work out… spoiler alert: sometimes it doesn’t). 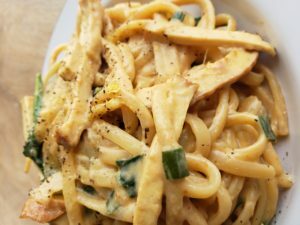 Honestly, this creamy pasta with a slight kick was so comforting, satisfying and delicious – it was simply restaurant-worthy. I wouldn’t be shy to serve this in a nice restaurant. And if you gave this to a non-vegan and told them it was vegan, they would probably not believe you! Anyway, you can watch the video above to see the process from start to finish – how I made it and the adjustments I made. The written recipe ingredients and instructions below have been tweaked based on the tweaks I made while I was cooking – so if you’d rather follow the written recipe, it’s there for you. 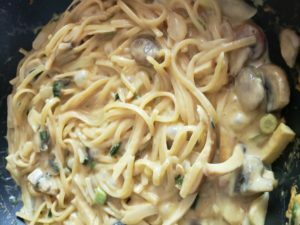 Now without further ado, here is the VEGAN Toowoomba Pasta Recipe aka Spicy Creamy Alfredo One-Pasta (I really don’t know what else to call this…). 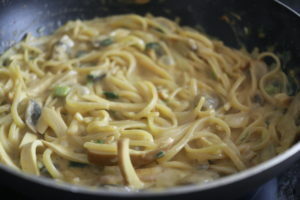 In a bowl, add coconut milk, soy milk, green onions and soy sauce and mix well. Cover and refrigerate for at least one hour (or overnight) before cooking. Meanwhile, this is a good time to chop all your ingredients! In a large non-stick wok or pot, heat a small amount of oil on medium-high heat. Add chopped garlic and cook for a couple of minutes until slightly browned. 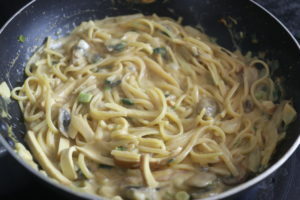 Add in onion, mushrooms and smoked tofu and cook for another couple of minutes, mixing around once in a while (I like to let it sit for a bit to let the mushrooms brown). Add in mirin and gochugaru (omit gochugaru if you don’t like spice) and mix well. Now add the milk and green onion mixture and vegetable broth and mix everything well together. Turn heat up to a high and add in the dry pasta. Mix well and bring everything to a boil. When the mixture comes to a boil, turn the heat to a medium low. Cover and cook for about 15 minutes, stirring frequently to make sure it’s not sticking. Add a small amount of soy milk, water or vegetable broth if you find that there isn’t enough liquid. Add salt (or omit if unnecessary – this is why it’s important to taste!) and mix everything well together. 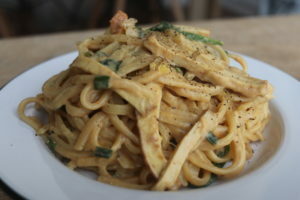 Optional: take off heat and mix in arugula (or other greens), top with pepper and nutritional yeast. Hi Rose, will definitely be trying this recipe! 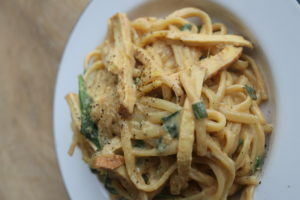 Why is it that your blog doesn’t have the recipes tap with all the recipes you made from the past!? I always used them when making recipes! 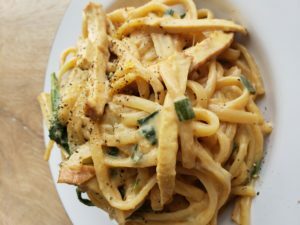 Most incredible vegan pasta recipe, I will never crave classic alfredo again, this is so much better! We have already made this recipe 3 times since you posted it. It’s simmering on my stove right now and smells AMAZING! Thank you! !